The inn-spectors are in Bethlehem and they are not pleased. A stable is no place for visitors and their newborn baby, and, it really is a health and safety nightmare! Can the inn-spectors be convinced that the stable really is fit for a King? Find out in this fantastic nativity musical for 4-8 year olds. Available with Words on Screen™ v2. It is census time in Bethlehem and the inn-spectors have been sent in to check that all the accommodation is up to scratch. They are horrified to discover that at one of the inns some visitors have been put in the stable and a baby has been born amongst the animals! It will not do at all! 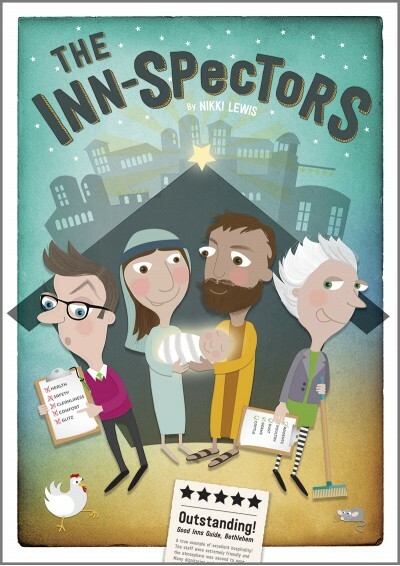 However, as Mary, Joseph and the donkey tell their story and the special visitors explain the good news, the inn-spectors realize that this is no ordinary baby and they declare that the stable is fit for a King! With eight fabulous songs and a really fun script written specially for 4-8 year olds, this nativity musical is perfect for your Christmas production. A nativity that ticks all the boxes! There are 50 speaking parts in this nativity musical. This can easily be reduced to 31. Click on the staging notes above for more details. Everything Has To Be Perfect! Yet again Out of the Arc have produced another fantastic nativity. We went to town with this one this year....a foot tapping donkey, feather boas, fans and sparkly wand for the star and huge star faces! Funny script, catchy songs and lots of parts for everyone to get involved. Staff, children and parents loved it.